OSS note implementation has been made much easier since transaction SNOTE was made available and in most cases is as easy as clickig a few buttons. SNOTE performs many of the tasks automatically, and even shows you if the note is valid for your system without you having to check manually. The first thing you need to do is get the latest version of the note into your SAP system. First, follow these instructions to check if the note has already been downloaded . If the note doesn’t already exist you will need to download it using the download icon with SNOTE. Even if the note does exist you might want to check if there is a newer version using the download latest version icon. Instructions for both options can be found here within the download SAP note documentation. Before implementing your first need to check it is relevant for you and the problem described is similar to the problem you are experiencing and is valid for your system. Also, check if there are any manual changes required which SNOTE will not be able to perform automatically. To do this first select the note from the list, if you have just download it the note will appear within the NEW section. Once you have found the note simply double click on it to open it. You will then see all the information about it including the full description, validity for your SAP system, list of objects affected, details of manual changes etc etc. 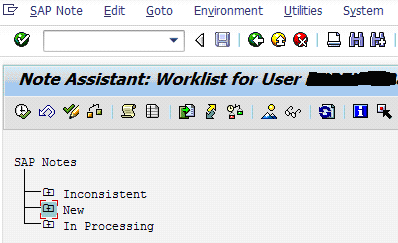 See implementation statuses for a list possible values that can appear in this field. You are now ready to implement the note, to do this simply press the implement/execute icon and follow the instructions that popup.